A savoury Lemon Meringue which will remind you of your grandmother's recipes. Taste these delicious oven baked Strawberry biscuits enrobed with Maple Syrup! Savour a delicious old-fashioned pie with Pecan Nuts. Vape a Coconut Cloud with Almond Cream ! 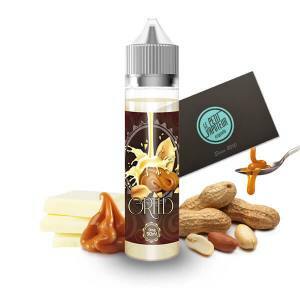 This Vap Land Juice is created for the gourmets with a Creamy Hazelnut accompanied with Pecan Nuts ! Appreciate this collection which is full of gourmandize. Each Vap Land Juice E Liquid is a real unique recipe which seems like it has come straight out of the oven. Do you like crunchy waffles? Taste the Vap Land Juice Crack's. Or do you prefer the acidity of Red Fruits? Let yourself be tempted by the Vap Land Juice Fränken Strange. Or are you nostalgic with pies of your childhood. Bite into this Vap Land Juice Pies E Liquid. The Vap Land Juice E Liquid Greed, itself, will melt lovers of Caramel. Do not forget that the Vap land Juice E Liquids are available in a 50ml bottle with no nicotine, in accordance with laws in force. You can associate nicotine boosters if needed to obtain the desired mixture, and appreciate the maximum of your Vap land Juice E Liquid.